How do you survive when the weather gets horrible? Do you want to know: how to deal with a blinding blizzard? what to do when a tornado hits? how it feels to get struck by lightning? 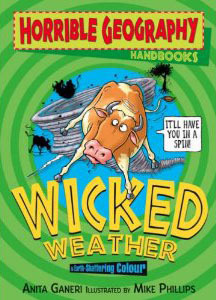 This work offers wicked weather facts, life-saving tips and heart-stopping survival stories. Geography has never been so horrible. Note: This is a companion handbook for the 'Horrible Geography' series.